As time passes, fewer and fewer people—even within the Antiochian Archdiocese—are still with us, who can vividly recall Metropolitan Antony Bashir, the man whom the late Fr. Alexander Schmemann called a “founding father of the American Church.” A half-century has passed since his repose on February 15, 1966, and now the Metropolitan endures mostly in black and white photographs and humorous anecdotes. Many of the clergy he ordained and many of the laity he inspired have already passed from this life, too. Yet that does not diminish the legacy of Metropolitan Antony, who guided Antiochians in North America through the Great Depression, World War II, and so many other conflicts during his 30 years of leadership. The Antiochian Archdiocese owes much to his efforts, and is commemorating the 50th anniversary of his repose this weekend. Fortunately, the Very Reverend Economos Constantine Nasr has served as Sayidna Antony’s biographer to ensure that his life was recorded for posterity. Since Fr. Constantine knew the metropolitan well in his later years, he has continued to aggregate the stories, historical documents, photos, and personal interviews All of Fr. 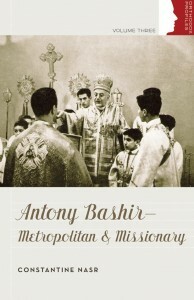 Constantine's efforts culminated in the publication of a biography of the Metropolitan's life, Antony Bashir: Metropolitan and Missionary. He also donated three boxes of the materials he gathered to the Metropolitan Antony Bashir Museum, located in Sayidna Antony's childhood home in Douma, Lebanon. His Beatitude Patriarch John X is scheduled to dedicate the museum this spring. Many American Orthodox know Metropolitan Antony pioneered efforts to unify the separate jurisdictions for one common witness to Christ as early as the 1940s. In 1961, he helped to found the Standing Conference of the Canonical Orthodox Bishops in the Americas (SCOBA). However, as Fr. Constantine says, few knew that Sayidna Antony tried to help renowned poet Kahlil Gibran translate his poems from English into Arabic, with great resistance. Sayidna Antony commissioned the translations of dozens of books, especially Divine Prayers and Services by Fr. 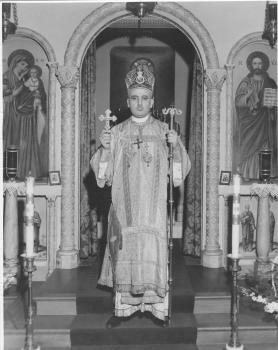 Seraphim Nassar in 1938 (still in use at chanters stands and in the Online Liturgical Guide), as well as the red Service Book in 1956 that sits in the pews of our parishes. He also founded The Word magazine in English in 1957, and personally edited it. Father Constantine notes that when the Metropolitan was not setting up frameworks for clergy education, the Board of Trustees, organizations, departments, and dozens of other ministries that endure to this day, Sayidna Antony was crisscrossing the continent, mostly on train and later by airplane, establishing churches and ministering to his flock. He would handwrite replies to letters he received on the backs of the letters themselves to save paper and money. Regarded as a giant of a man, Sayidna Antony was no stranger to humility, explains Fr. Constantine. Once, His Eminence visited Toledo, Ohio, where parishioners and civic leaders greeted him on the tarmac. “I felt seven feet tall,” His Eminence said. Then, he addressed the grand banquet where his words were enthusiastically received. “I felt eight feet tall,” His Eminence remarked. Then, he celebrated the Sunday Hierarchal Divine Liturgy in a jam-packed hotel ballroom. “I felt ten feet tall,” His Eminence reported. Metropolitan Antony returned to New York and began “to shrink.” No one picked him up at LaGuardia Airport. “I felt eight feet tall,” His Eminence said. He got out of his taxicab at his home in Brooklyn, climbing 15 steps to his front door while hauling his luggage. “I felt seven feet tall,” His Eminence noted. His sister, Adele, stopped him at the door and said, “Honey, before you come in, take out the garbage.” “I felt three feet tall,” His Eminence concluded. Metropolitan Antony was not afraid to teach humility either, adds Fr. Constantine. One priest kept asking for transfers to “easier” parishes where the people would not fight him. Having had enough, Sayidna Antony gave him an address where the priest could find the parish council of his new assignment waiting for him. The priest arrived at chapel located in the middle of a cemetery, of all places. To this day, Fr. Constantine is grateful Sayidna Antony brought his father, Fr. 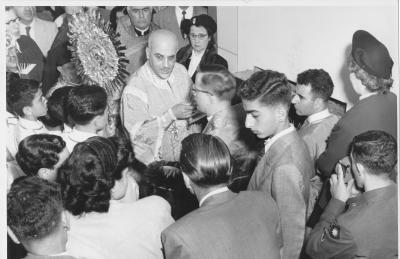 Zachariah Nasr, to North America in 1954 to minister in the Archdiocese. He adds that he is also thankful for the enduring examples and standards established by His Eminence, and he is is honored that he could become Metropolitan Antony's biographer. “I’m happy that I can do something that is beneficial to the Church,” Fr. Constantine says. Father Constantine Nasr has retired from active parish ministry, but not ministry in general. He has authored Journey Through the Divine Liturgy, Practical Guide for Priests and Pastors, Mastering the Art of Marriage, and other titles. He travels the continent to give lectures on missions and evangelism, marriage, parish leadership, and much more. Father Constantine can be reached at 405-503-6277, and at revnasr@yahoo.com.